Cover the highlights of ancient Egypt, without skimping on comfort. 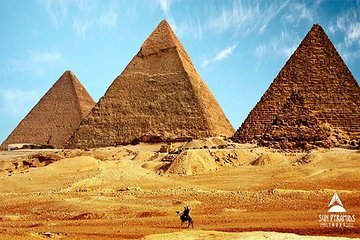 On this full-day tour, you’ll get an in-depth overview of the must-see sites, including Sakkara, Memphis, the Giza Pyramids and Sphinx, and Old Cairo. Plus, you’ll enjoy VIP perks like a local lunch, panoramic dinner in Cairo’s specialty spinning restaurant, and a refreshing juice overlooking the pyramids at sunset from the terrace of the Great Pyramid Inn Hotel.